With the right additional hardware, the RTL-SDR software defined radio can be used as a super cheap radio telescope for radio astronomy experiments such as Hydrogen line detection, meteor scatter and Pulsar observing. Two slightly-different designs for a simple, small, effective, radio telescope capable of observing the Sun, and the galactic plane in both continuum and spectral modes, easily able to show the hydrogen line in various parts of the galactic plane. He uses the RTL-SDR as the receiving radio with an LNA (low noise amplifier) and a couple of line amps, a 93cm x 85cm offset satellite dish (potential dish for sale here, and here), and GNU Radio with the simple_ra application. In his results he was able to observe the spectrum of the Galactic Plane, and the Hydrogen Line. Some more information about this project can be found on this Reddit thread. Here is a link to an interesting gif Marcus made with his RTL-SDR, showing a timelapse of recorded hydrogen emissions over 24 hours. Reddit user patchvonbraun (a.k.a Marcus Leech) writes on this thread an explanation of what is going on in the gif. Interstellar space is “full” of neutral hydrogen, which occasionally emits at photon at a wavelength of 21cm–1420.4058Mhz. If you setup a small dish antenna, and point at a fixed declination in the sky, as that part of the sky moves through your beam, you can see the change in spectral signature as different regions, with different doppler velocities move through your beam. This GIF animation shows 24 hours of those observations packed into a few 10s of seconds. Marcus’ setup is shown below. 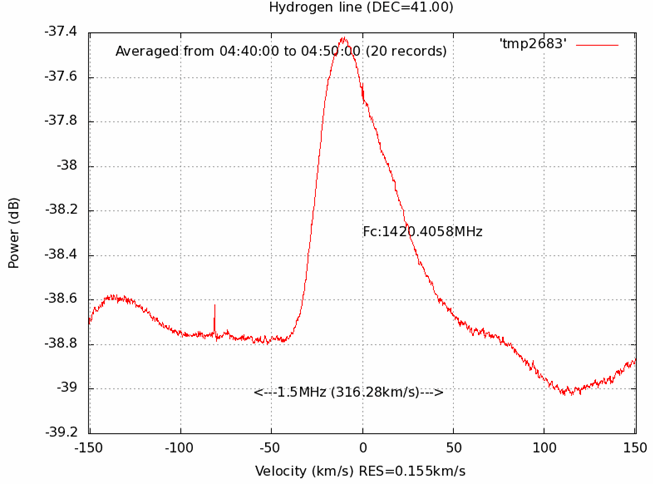 And here is just one of his many resulting graphs shown in the document showing the Hydrogen line. A similar radio astronomy project has previously been done with the Funcube. More information about that project can be found in this pdf file. In that project they used the Funcube, a 3 meter satellite dish and the Radio Eyes software. However, in this Reddit post patchvonbraun explains that the Funcube’s much smaller bandwidth is problematic, and so the rtl-sdr may actually be better suited for radio astronomy. This image is from the Funcube project document. Another related project is the Itty Bitty Telescope (IBT), which does not use SDR, but may be of interest. In Europe typically the Graves radar station can be used for meteor scatter experiments. Graves is a space radar based in France which is designed to track spacecraft and orbital debris. If you are in Europe you can also make use of the Graves radar simply by tuning to its frequency of 143.050 MHz and listening for reflections of its signal bouncing off things like meteors, planes and spacecraft. Since Graves points its signal upwards, it’s unlikely that you’ll directly receive the signal straight from the antenna, instead you’ll only see the reflections from objects. In other countries old and distant analogue TV stations can be used or FM transmitters can also be used. To set meteor scatter up, simply use an outdoor antenna to tune to a distant transmitter. It should be far enough away so that you can not be receive the transmitter directly, or the signal should be weak. If you detect a meteor the signal will briefly show up strongly at your receiver. Performance can be enhanced by using a directional antenna like a Yagi to point upwards at the sky in the direction of the transmitter. A pulsar is a rotating neutron star that emits a beam of electromagnetic radiation. If this beam points towards the earth, it can then be observed with a large dish antenna and a radio, like the RTL-SDR. Pulsars create weakly detectable noise bursts across a wide frequency range. They create these noise bursts at precise intervals (milliseconds to seconds depending on the pulsar), so they can be detected from within the natural noise by performing some mathematical analysis on the data. Typically a few hours of data needs to be received to be able to analyze it, with more time needed for smaller dishes. One problem is that pulsar signals can suffer from ‘dispersion’ due to many light years of travel through the interstellar medium. This simply means that higher frequencies of the noise burst tend to arrive before the lower frequencies. 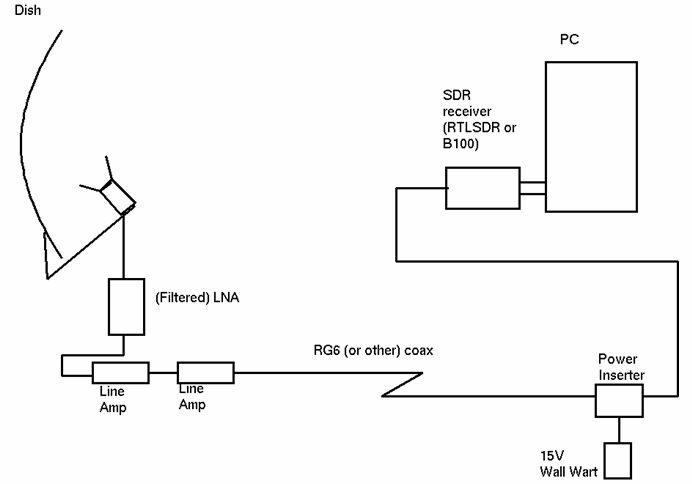 Mathematical de-dispersion techniques can be used to eliminate this problem enabling one to take advantage of wideband receivers like the RTL-SDR and other SDRs. 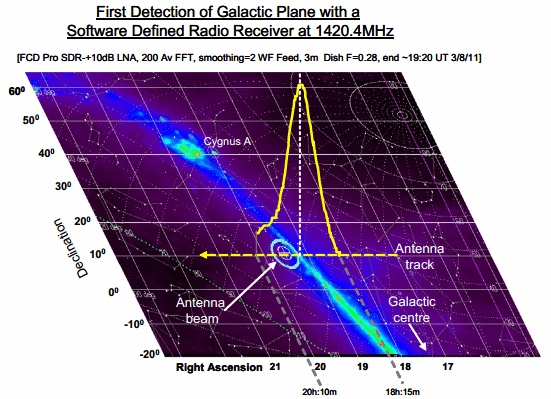 The more bandwidth collected and de-dispersed, the smaller the dish required for detection. Pulsar detection requires some pretty large antennas, and a good understanding of the techniques and math required for data processing so it is not for the beginner. See the previous Pulsar posts on this blog for more information. What software can be used (in Windows platform) to record the detection of hydrogen line? simple_ra for linux seems to work but is to difficult to install! hello guys ,i have a typical helical antenna with 12 turns ,for hydrogen line , and i bought it yesterday from somebod ,he made me this antenna by custom , and i have an rtl sdr r820t 2832u , the first appeared on the market, and i bought even a special coax rg 316 and i mount everything in sight and i started to scan to see if the antenna works ,and it scans nothing to me ,no peak or other thing comes in why is that , and what else do i need to receive on 1420 mhz, please help me? You using any LNA’s + filters? Well no and from where should i buy these? I want to see and work by radder. We have built two horn antennas, and successfully detected the 21 cm hydrogen line using the RTL-SDR. I found out I can actually pick up a very faint 21cm line on the good ol’ TV dongle SDR with just the cruddy aerial it comes with. Cant do anything useful with it, but it was good to show the kids a little bit of science.